Maid in Australia: You drew WHAT? So, Miss 8's class is currently doing a food drive for poor people in the community. (That would include us then. I'm kidding. I know we're a lot better off than others). Anyway, in a bid to encourage other students to donate cans of long-life goodies for the cause, Miss 8 and her friends have been busy making posters. Phew, I was seriously worried for a minute there that I'd be hauled in before the principal to explain our baked bean shopping habits. 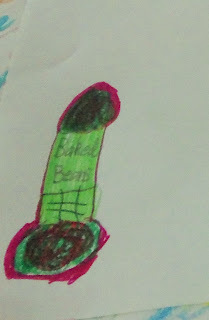 Readers, have your childrens' artwork ﻿ever given you cause for alarm? Or giggles? ROFLMAO Oh my I'm wiping tears from my eyes Bronnie. Thanks for a huge belly laugh! Bet the teacher got a fright, then a giggle too. Bahhaaaaaa. Thanks for the early morning giggle! hahahaha! Lucky she labelled it!